Students sample fish and macro-invertebrates in the State Scenic Kokosing River. Index species found throughout the river testify to its high water quality. Seventy eight species of fish call the Kokosing their home. The 'Botany and New Botanical Art' class takes in one of many views at the BFEC. With a rich diversity of habitats, flora and fauna, the BFEC provides endless sources of artistic inspiration. An outdoor classroom AND studio, the BFEC provides no shortage of potential stages. Here dancers perform faculty-choreographed pieces above the Kokosing River- and IN the river itself! Investigating the behaviors and capabilities of Neanderthals takes a turn outside in Dr. Bruce Hardy's innovative class at the BFEC. Students test the practicality of popular scientific hypothesis under real-world conditions. You haven't lived until you've cut down a tree with a rock in the snow! The BFEC is a unique academic resource serving students and faculty regardless of department. From scientific research to artistic expression, its diverse landscape provides endless opportunities to explore. With both indoor and outdoor facilities, it is one of Kenyon's most beautiful and unusual places to learn and teach. 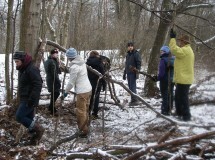 The BFEC offers access to a variety of habitats that can be used for student projects. 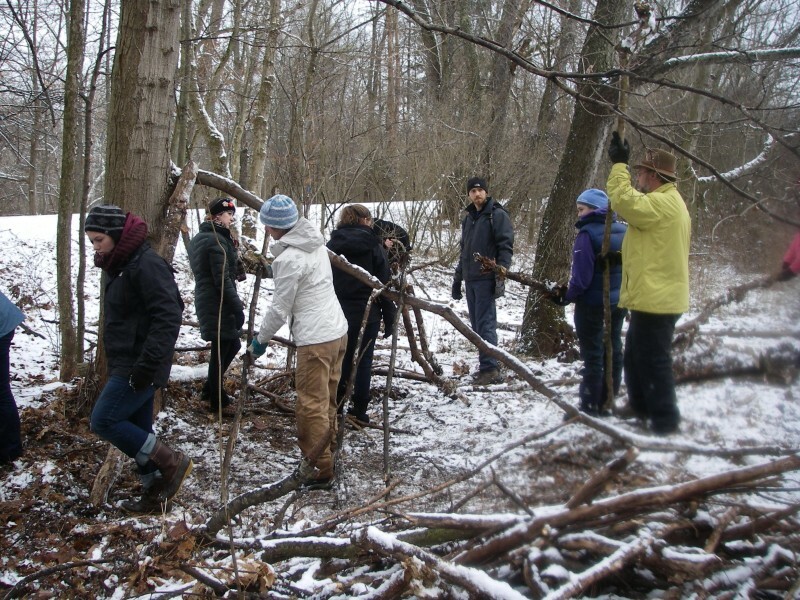 Kenyon faculty members collaborate with students to conduct research on carbon sequestration, wetlands, forest structure, seed dispersal, bird behavior, population ecology, and more. Each semester, faculty bring students to different locations at the BFEC in pursuit of academic excellence. Students enrolled in Biology and Ecology classes are the most predictable visitors, but we also see students in fine arts, anthropology, sociology, English, religion, and more. Beyond our 500-acre preserve, the BFEC features a resource center with classroom, laboratory and meeting space; an outdoor classroom and picnic shelter; the Bemis research Aviary and almost every aquatic and terrestrial habitat type found in central Ohio. We strive to meet the needs of students and faculty regardless of department or how creative their ideas for using BFEC spaces. Kenyon’s new major in Environmental Studies prepares students to answer questions about the environment. This interdisciplinary program examines the intersection of individuals, societies, and the natural world in both a local and global context. The major provides a broad understanding of environmental issues. While examining the archaeological and paleontological evidence that shapes our understanding of Neanderthals, Kenyon Professor Bruce Hardy's upper-level Neanderthal class frequents the BFEC for a more hands-on approach to assessing their capabilities. Would Neanderthals have benefited from shelter? Build one to find out. Dr. Hardy uses a block of flint to prepare the site. A central ridge will support branches leaning from both sides. The skeleton of a structure. Checking for gaps from the inside. Thermal buffering will be monitored throughout the winter.